Liu, M., Kalk, D., Kinney, L. & Orr, G. (2012). 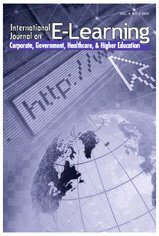 Web 2.0 and Its Use in Higher Education from 2007-2009: A Review of Literature. International Journal on E-Learning, 11 (2), 153-179. Waynesville, NC USA: Association for the Advancement of Computing in Education (AACE). Retrieved April 18, 2019 from https://www.learntechlib.org/primary/p/34087/.